Too much work and not enough time. I’m currently working at Space Digital in Manchester on a show for CBBC – which will have to remain nameless for the timebeing. Everything’s going well, the people here are great, the work is definitely challenging and the work doesn’t seem to want to end. Starting to get together ideas for a short film, about a masai warrior. This was a quick sketch created online using odosketch. If you haven’t ever tried it, do. It’s top. There has never been a human character to enter the Tardis and say pretty much anything other than “it’s bigger on the inside”. What does he say? “It’s another dimension” – and with an almost malevolent expression too. It’s only for a second, but without knowing I would say this is the face of a man who does not like the Doctor. No, not in the he’s-nicked-my-girlfriend way, but in the I-really-hate-you-with-a-passion-beyond-anything way. And then he backs it up with some references to FTL – Faster Than Light drives a.k.a. space-time travel – and parallel universes. Is this a hint being dropped onto us by Moffatt? Maybe. And no one, no one is that boring. Even Mickey had something about him. No, I think there’s more to this guy than meets the eye. As to seeing more than one Doctor in this episode (check out my previous post for what I mean by this) I haven’t noticed it yet, but give me a chance. It’s a list of all the best websites you should ever need to go to. Obviously, it’s missing mine 🙂 but you can’t have everything. The web design blogs in particular are great. A First Look at V! MORENA BACCARIN AS A LIZARD! That’s got to be good – as well as the little reference to Independence Day ripping off the original V – I love it!! …talk about me being out of touch. This came out on the 8th of August! Well, roast my chestnuts! It means I can talk about it, which is great, but I can’t show anything or really explain much at all. Not to worry, at least I can talk about what’s going on a little bit within the bounds of an NDA, of course. As and when I can tell you stuff, I’ll put it up. For now I’ll just say that After Effects CS4, a 64 bit PC with more processing power than I’ve ever seen in one box and an Wacom Intuos 4 are my weapons at the mo. Oh, and Maya 2010. Not gotten round to even looking at TOXIC, sorry, Maya Composite, and if this goes the way it seems, It’ll be a while until I do. The 11th Doctor – Who? This is the face of the next doctor. Slightly young isn’t it. Yesterday on a 35 minute special on the BBC, Doctor Who Confidential went through and listed the last ten doctor’s before quite unceremoniously letting the world see the face of Matt Smith talking with his extremely long fingers about his take on the role of the 11th Doctor. Personally, I think the adult fanbase will be a little worried about this. Reminding myself that it is a children’s show, maybe having a Doctor only seven years out of his teens – but looking like a nineteen year old student, let’s be frank – will make the whole thing even more down with the kiddies. It might, however, make it more like the a Sarah Jane Adventure than a Doctor Who. How can he face down a Dalek? At least he’ll be fit enough to run away. And as for the general take on this? My six year old Daughter put it quite well. 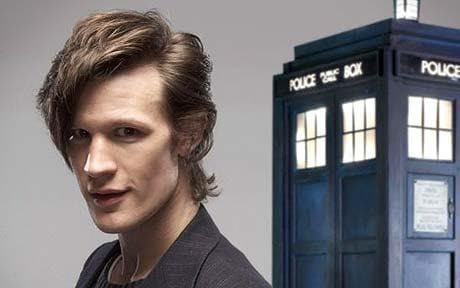 She took one look at him and said, “He’s going to be the next Doctor? Oh. Okay.” The truth of it is, my 37 years means nothing. If my children accept him as well as they did Tennant’s take on the Doctor – which has become the new benchmark since Tom Baker and his jelly-babies – then Moffat et al will win over us oldies.